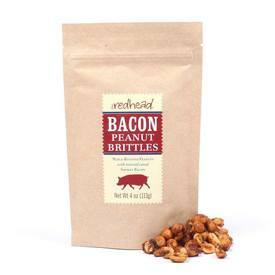 We are pleased to announce our newest offering, Bacon Peanut Brittles! Maple roasted peanuts with cured bacon and spices - this snack is seriously addictive!! Made famous at The Redhead restaurant in NYC, these are the perfect Bacon "Beer Nuts" (a little sweet, a little savory). Try them, you'll love them! !